As a former high school principal, I remember the challenges faced by staff and leaders to engage students in grades nine through twelve in their educations. They enter high school as awkward, goofy and sometimes very serious 14 year olds; they leave as experienced leaders, eager citizens and prepared for higher education, the workplace or the military. That’s if everything works well at school, home and in the social world. Many students struggle with this huge transition and sometimes the adults struggle right along with them. What does it take to plan for, inspire the staff and students and execute a culture of excellence? Mr. Brett Elliott is the Principal at Richwoods High School in Peoria, IL. He is an experienced leader who has worked in some of the toughest, urban environments but never lost his sense of wonder and fun. As a former coach, he knows how to organize, cheerlead and console. 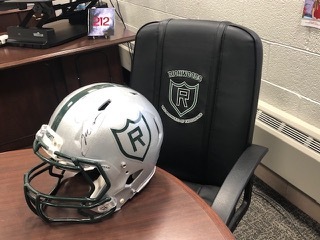 In the podcast listed below, Brett shares his thoughts on creating “The Standard of Excellence.” Pictured is a signed Knight helmet from graduate Sherrick McManis (NFL Chicago Bears cornerback from Richwoods).